UPDATED: Sort of a confirmation for the below as Hanlon at the Daily Mail has posted an article where HarperCollins, the publishers of the Times Atlas Greenland fiasco, try to argue that they only depicted white the areas with ice>500m thick. Strange things are always afoot, in matters of climate. 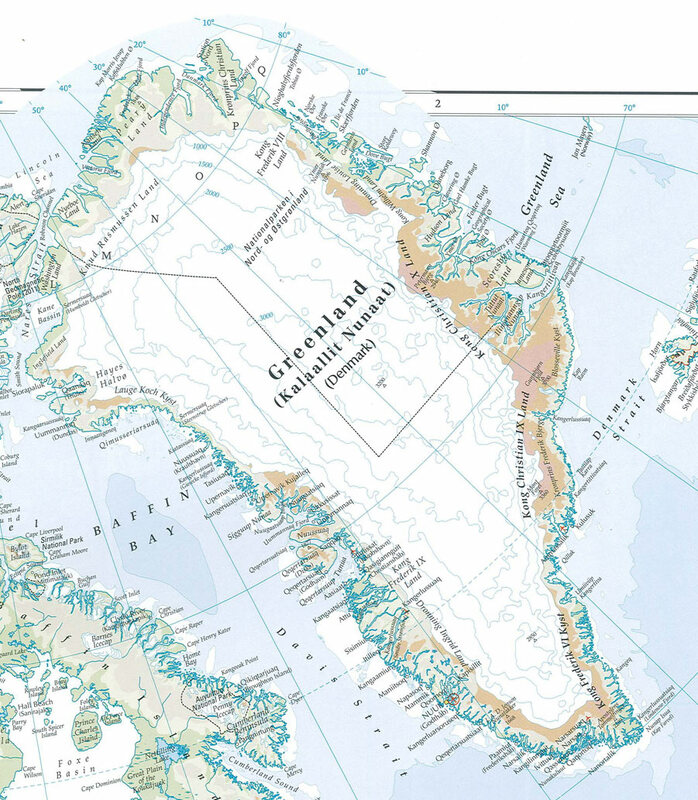 There are two possible interpretations for that: either some people at the Times Atlas have decided to reinvent the world adding fantasy features to a previously fully white map; or, much more likely, they have used some other, existing map of Greenland, embellishing to conform to the Times Atlas style. 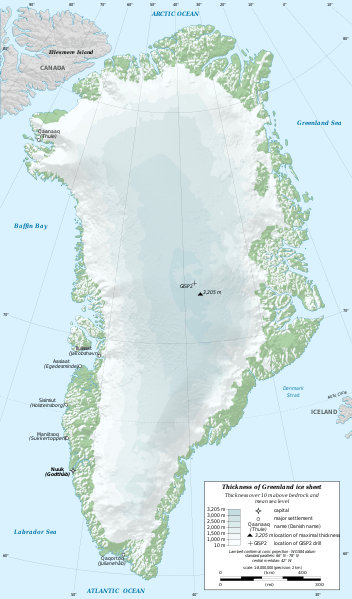 In fact, and intriguingly, and twice embarrassingly, there exists one map that strongly resembles the Times Atlas’ “15%” Greenland (see also the Greenland Physical Map from TourTeam.dk). And the embarrassing bits are: it’s one map used on Wikipedia. 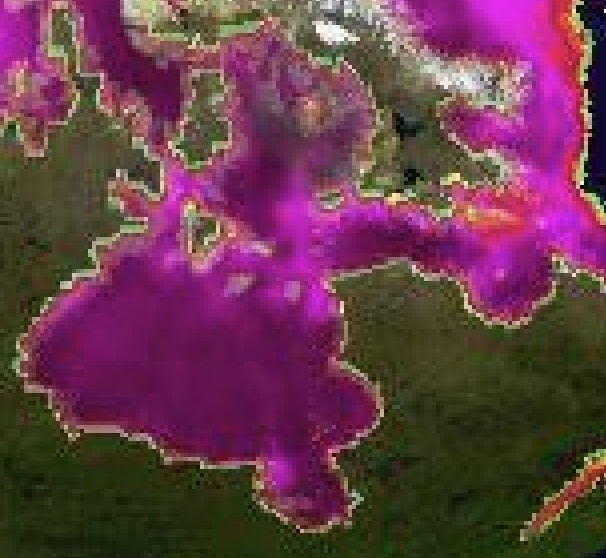 Worse, it’s supposed to be only showing ice sheet thickness, not “cover” as claimed (it doesn’t highlight the areas where the ice is less than 10m/30ft thick). Look for example at the outline of Eastern sides of Kong Christian IX Land and Kong Christian X Land, the nearest to Iceland (brown on the Times Atlas to the left, green on Wikipedia to the right). 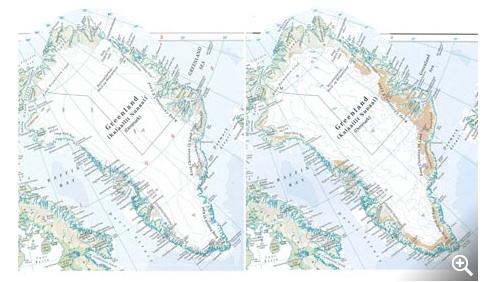 Look now at the Times Atlas’ Greenland map of 1999 (below, to the left) and the fact that their 2011 map (center) is so much alike the Wikipedia Greenland ice-sheet thickness (right) becomes even more evident. Now where’s the evidence for it? Where is it indeed, as Michael Corleone would have asked. This doesn’t look like a good way to enhance the reputation of a publication like the Times Atlas. As usual, it’s the stubborness of their response the real problem, perhaps even more than the original error. One is left wondering how many more mistakes have been made (perhaps them too, miraculously similar to maps posted on Wikipedia), mistakes simply too small to immediately notice. And the publishers and editor will never admit one anyway. Averages can only tell you so much, and that’s quite little. 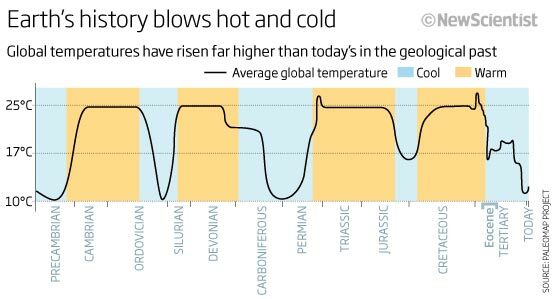 As “global warming” is based on worldwide averages, it should be then always looked at judiciously and with a good deal of curiosity to figure out what is happening above and beyond the simple figure that is an average temperature. Say, one lives in Placeville, a town where it’s -20C in January, +20C in July. Average is zero C (32F). Imagine now, winters warm by 10C, summers cool by 5C. So it’s -10C in January, +15C in July. 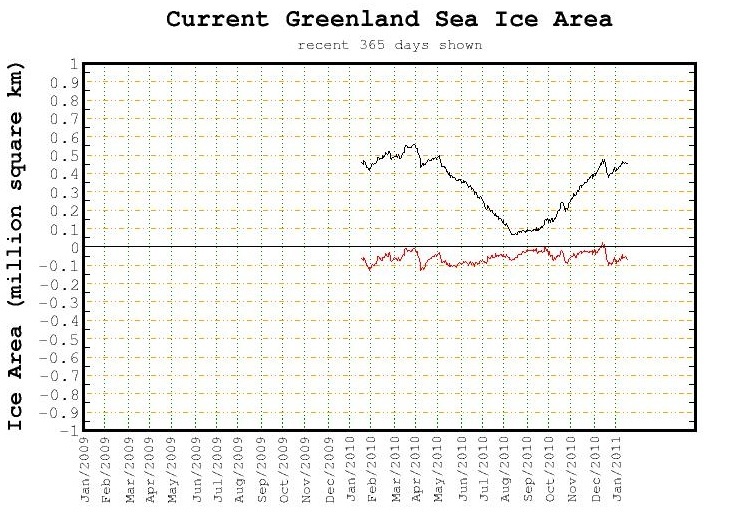 Average is 2.5C (36.5F). Headline news: “Placeville heavily hit by global warming, average temperatures up by 2.5C“. When the real-life news is, it’s much cooler than before: still very cold in January, and now not even warm in July. This is such a simple concept, I am always amazed how many people don’t get it. But then few grasp the most elemental aspects of statistics. And I wish three people in the world understood what “global warming” might be about. For as long as predictions will be difficult, especially about the future, “denialism” will as a matter of course remain appropriate only in the context of past facts, i.e. in the “denial” that they actually occurred. So let’s set aside the widespread, idiotic name-calling against anybody having any question regarding impending climate catastrophes: because the real Climate Deniers are very easy to spot. And it’s the people that to this day still live in the fantasy world where Climategate was a non-event and had no consequence (esp. on the science of climate change). You know, the people that haven’t read Andrew Montford‘s GWPF report, or the findings of the Muir Russell review, or Lord Oxburgh’s comments about reconstructing temperature trends for the past 1,000 years (Q36 in the link) (or, erm…my preface to the Italian translation of Montford’s report). Or they have read the lot, but due to their denialist attitude they can’t fathom the meaning of what’s written in there. Everybody else might have instead noticed by now that a major. widely-funded, “independent, replicable, inclusive, transparent…approach [to] estimate…global temperature change” (and “the uncertainties in the record“) is expected to come to fruition sometimes next year. 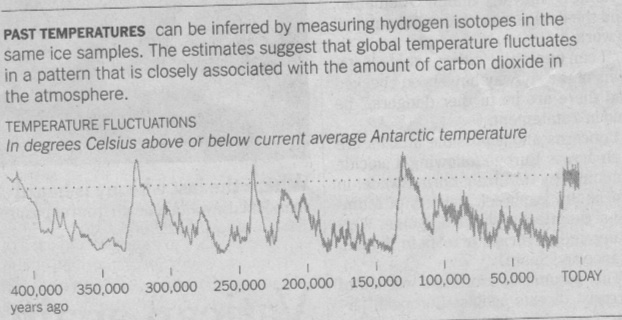 And yes, Climategate had an important role in getting Berkeley Earth Surface Temperature (BEST) up-and-running. QED…all those labelling of non-believers as “deniers” has simply been a kind of preventative attack. And finally, it has backfired. We will all be left with a slightly-warming world, the only other certitude being that all mitigation efforts will be among the stupidest ideas that ever spung to human mind. Have Things Changed Much From 1969? 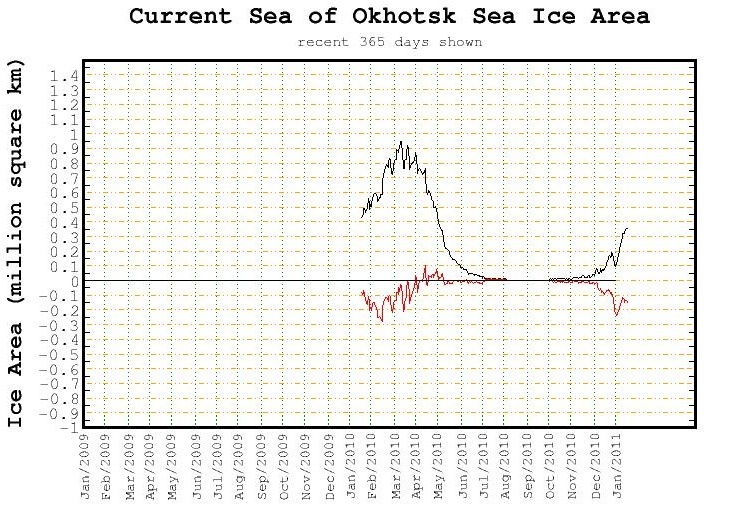 “Expert Says Arctic Ocean Will Soon Be an Open Sea; Catastrophic Shifts in Climate Feared if Change Occurs“. Yes, it’s 1969. This is getting boring. Seemingly all one has to do in order to find instances of past climate change, totally invalidating the “unprecedented” claim attached to today’s, is to guess the right combination of words for this or that search engine. AGWers should have tried earlier, in the age before the Internet, when fantasies such as labeling any unusual weather pattern as “anthropogenic” would have been easier to maintain. They’ve got incredible supercomputers to play with, but still our climate scientists build up global anomaly charts from only a handful of stations (1,000 or so if the guys at Climate Monitor are not mistaken, or one on average for every area the size of Bangladesh). You’d think world-rescuing climate specialists would have computers and bandwidth enough to handle data from a million stations by now, or a billion even. But they say they don’t even need that. 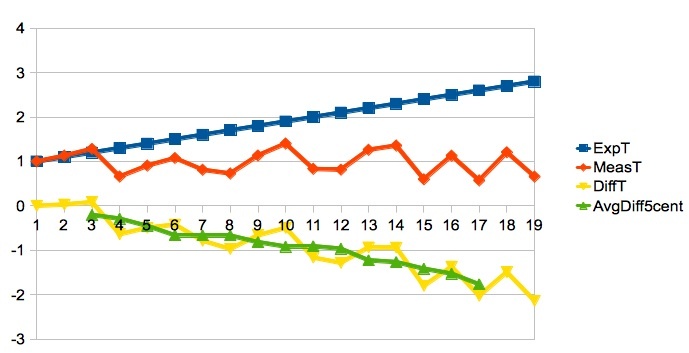 Who would believe that it all depends on a correlation coefficient of…0.5? Just like with the drowning polar bears that weren’t in 2008, the Daily Mail is now the source of another idiotic “it’s climate change!” story. 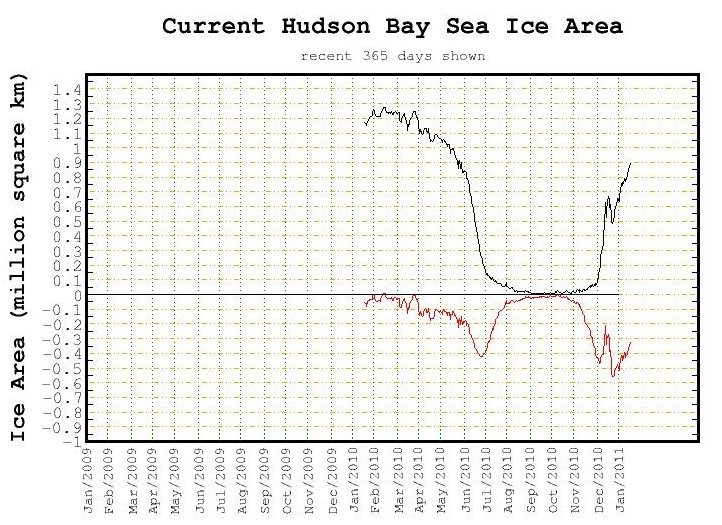 Ver shortly, reports of the town of Ilulissat having seen the sun two days earlier than usual after the darkness of winter, have been presented as the result of “melting ice caps” that “have lowered the horizon allowing the sun to shine through earlier“. Very few people have fallen for the latest Daily Mail pearl. Maybe it’s because of Climategate, maybe catastrophism is going out of fashion (see Guardian’s “false claim” story, a journalistic indictment of the AAAS). Hope at last! 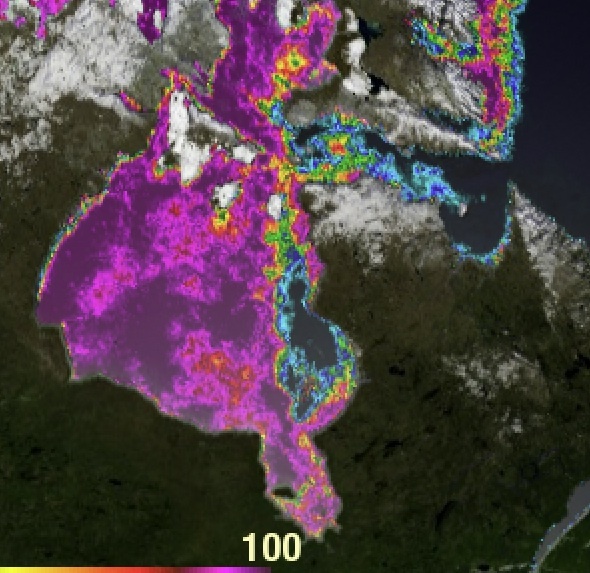 Continuing in my investigation of how “unfair” the situation is regarding Arctic sea ice and its forever-negative anomaly (forever-negative since it is calculated against a reference is pretty much the most sea ice the Arctic will ever going to see), some curious results about where the 1.1 million square kilometers are missing from. 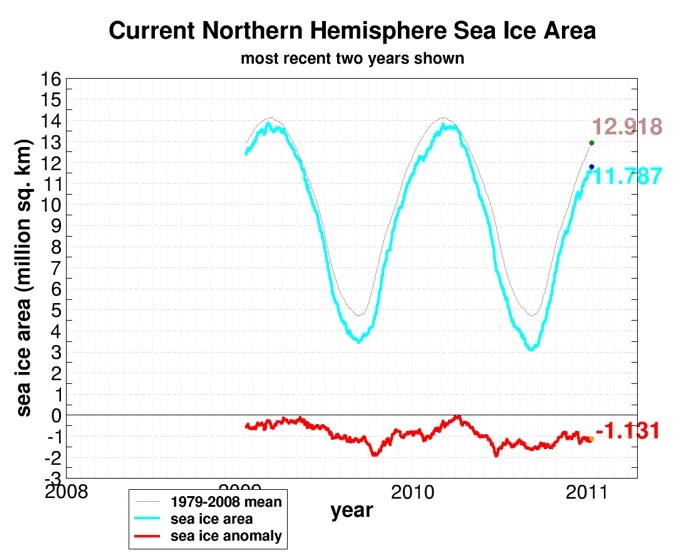 As of Jan 16, Cryosphere Today reports 1.131M sq km of missing Northern Hemisphere sea ice area. In other words, there is no way that those places could contribute a positive anomaly that would balance out the negative ones listed abov. 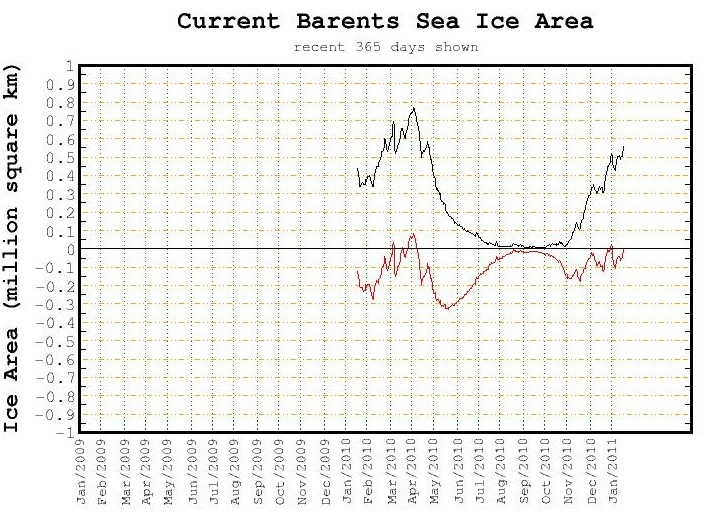 The only Arctic place that could contribute anything positive to the anomaly is actually the Barents Sea (where it is currently zero). And where are all these non-full negative-anomaly areas placed? 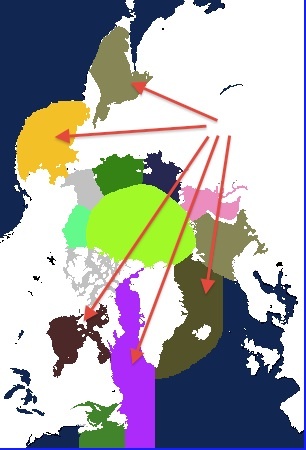 Why, they are all at the edges of the Arctic ocean. 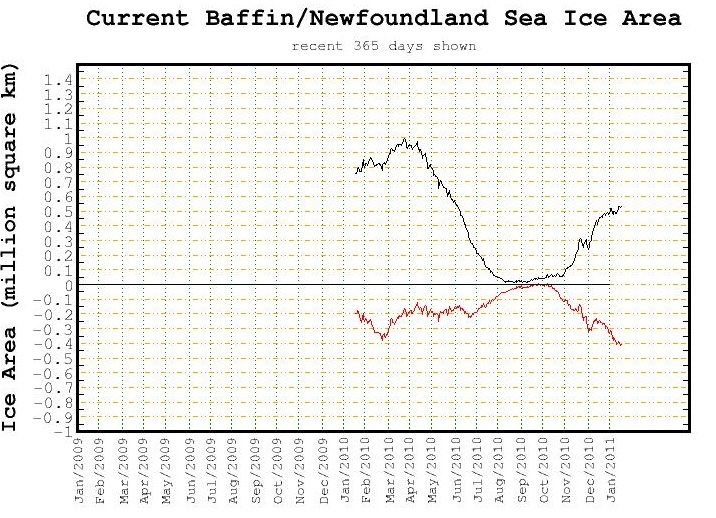 This strongly indicates it’s not a generalized Arctic warming that is behind the “missing Arctic sea ice area”/negative anomaly, but something connected to sea currents.In fact, the Hudson Bay situation shows this nicely: it’s not the actual Bay that is missing most of the ice, it’s the Hudson Strait linking the Bay to the (negative-anomaly) Baffin/Newfoundland area. “researchers have found an ancient mummified forest in a nearly treeless section of the Canadian Arctic that is now surrounded by glaciers“: indeed, linked National Geographic article mentions a time in the past when “the Earth’s climate was drastically changing“, and mentions another NGS article yet, showing how forests contain in-built mechanisms to quickly expand to new areas when the conditions are warm enough. Hopefully nobody’s suggesting those mechanisms haven’t evolved in the remote past.. 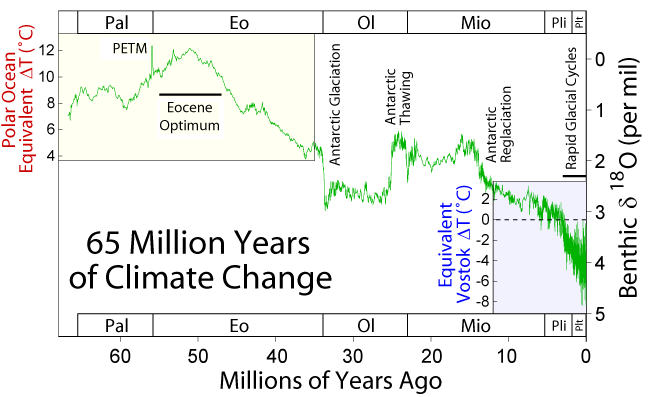 I do expect AS to come out against current mainstream AGW theory sooner rather than later (sooner than the hopeless critical-thinking-free Scientific American, at least). One little chip at a time, even the strongest wall will come down. If a rich man has two chickens, and a poor man none, both people are well-fed on average whilst one of them dies of starvation. Likewise for Global Warming. This is a paradox strictly linked to the idea of working with temperature anomalies on a planetary scale. Imagine in fact if we had a Polar station with an anomaly of +15C, with average temperature going from -60C to -55C; and a Temperate-zone station with an anomaly of -5C, with average temperature going from +10C to +5C. In those circumstances, the planetary temperature anomaly would go +10C, even if everybody would experience it quite cold. Worse: if the temperate areas had anomalies around zero, the planetary temperature anomaly would shoot to +15C, a giant number with no practical consequence whatsoever: because if the temperatures go up mostly where it’s very very cold, nobody anywhere sees any of the fabled “warming” effects linked to temperature increases. 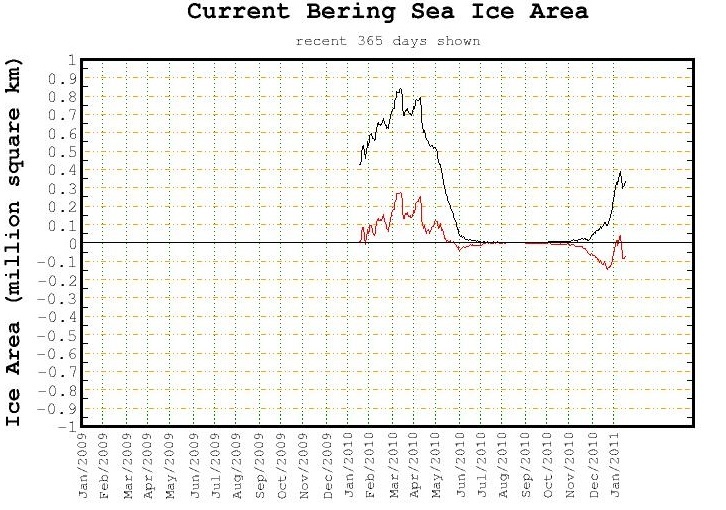 And in case you wonder, that’s exactly what is happening, according to GISS, on planet Earth.